For all of the current nostalgic postulating over the 1970’s being the last “Golden Age” of American Cinema (it certainly didn’t feel that way on a week by week basis, but the distasteful chaff is always separated from the nourishing grain through the filters of treasured remembrance), there were many essential elements which helped characterize the studio era of Hollywood film making that suddenly appeared extinct. By the end of the 1960’s the charm of the movie musical was supplanted with garish, insupportable elephantine production values, the film noir disappeared with the absurdly shortsighted obsolescence of black and white cinematography, and westerns- once the purest of American culturally mythological forms -were suffused in a climate of contemporary revisionism which resulted in many interesting and sometimes artificially challenging works, but were absent of that special quality to which Hollywood, for all of its faults- and God knows they were legion -were almost unparalleled in infusing into even the grimmest of narratives (often to the detriment of the film, but that subject of immoderation requires more consideration than space currently permits), and that is class. 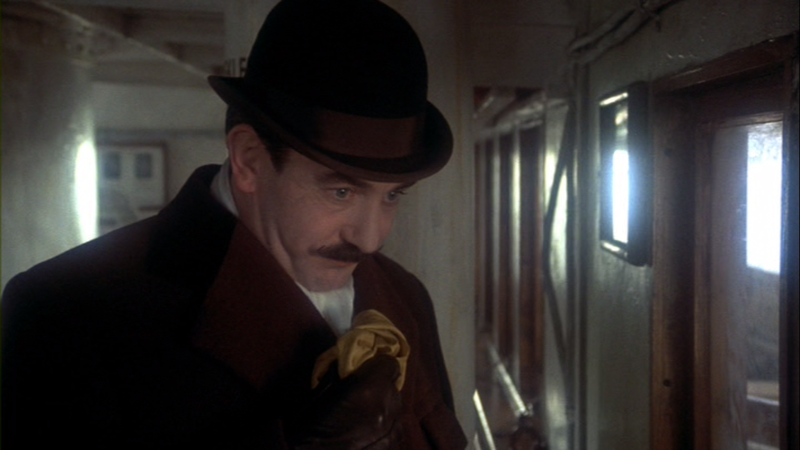 For an example of the infusion of the aforementioned quality into what might seem a peculiar circumstance- homicide, after all, isn’t generally thought of as a charming situation -one need look no further than Sidney Lumet’s 1974 film “Murder on the Orient Express”, a fizzy confection that is the perfect antidote for the generally dour films of that particular period, concerned as they were with the disintegration of traditional values, trust, authority, societal structures- just about everything -and the films of today’s special brand of cinema which favor computer generated creatures over flesh and blood humans with the gift of performance craft. Lumet’s film, by 1974 already a throwback to bygone days and a miracle that it was even produced, is in equal portions sophisticated, charming, funny when it’s supposed to be funny and dramatic when it’s not, entertainingly effervescent in a way that comes naturally when real actors are allowed to play with the full richness of their gifts and supremely, satisfyingly elegant (it literally glitters through Geoffrey Unsworth’s diffused, gauzy lighting design)- and remember, this is directed by a man lauded for his mastery of gritty urban crime drama. It is a film, to use a fatigued axiom: as they used to make them, or more correctly, how we rather optimistically imagine how they made them. This entry was posted in acting, Agatha Christie, books, Film, Film Reviews, movie reviews, Movies, Mystery, Reviews, Sean Connery, Sidney Lumet and tagged Albert Finney, Ingrid Bergman. Bookmark the permalink. Excellent review, this film has such a talented cast.